This is the perfect rack to show off your snowboard! Just like a bikini this rack covers only what is absolutely necessary and leaves the rest to show off your sweet ride! 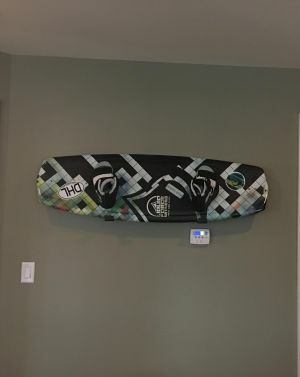 It holds your snowboard on the wall without overwhelming your board or house with a big bulky rack and lets those sweet deck graphics show. Construction. The Snowboard Naked Rack is made from high quality aluminum. The base then gets a foam rubber applied to cushion your skateboard and also add some friction so your snowboard does not slip. It's designed and made in the USA by skilled metal craftsmen. Storage and Display. The Snowboard Naked Rack displays and stores your snowboard in a very compact and efficient way. It lays it pretty much flat up against the wall, so it is not sticking out into the room. It turns your snowboard into ART! 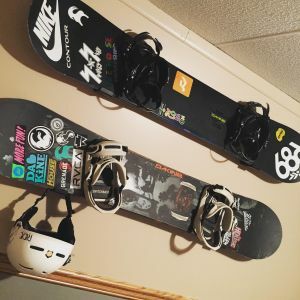 Choosing a Rack Size: what fits my snowboard? Medium: Extends 3.75" from the wall with a .75" lip. Ample size for displaying decks only, without bindings. Can work for some smaller-sized snowboards with bindings (or use without bindings). Large: Extends 6.5" from the wall with a 1.25" lip. Ample size for displaying larger boards with heavier bindings. 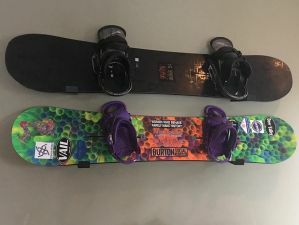 Allows your snowboard to rest in a more horizontal orientation (rather than vertically), preventing your bindings from making your board too top-heavy and tipping out of the rack. The Naked Rack has got me pretty stoked. Looking at the racks, they are pretty simple but that was exactly the point. We listened to some customer feedback that they didn't want to see the rack that was holding their board. As you can see from the pictures our snowboards look great in the Naked Rack. It almost looks like the board is floating which is a great look in any space. I know we sell a few racks that make the boards look like they are floating (most notably our Skateboard Deck Rack) and they are HUGE sellers that customers cannot get enough of. This is a sturdy, solid solution for snowboards that you should definitely check out. By the way - did you check out the price? At that price you might as well get a few for all your boards! Hey! This is Josh from StoreYourBoard.com, here today to talk about the Naked Snowboard Rack. Here it is behind me with a snowboard in it and here it is in front of me with just the rack, so this is part of our Naked Rack series, built tough but very minimalistic. It looks great in the wall, super display type view but also useful storage. What it is a piece of aluminum, so very strong yet lightweight and also won’t rust. It’s bent and then after that, we put a piece of felt on it, which is dense but soft, so that really protects your snowboard edges, so you have no issues there. It comes in two different finishes. We got a very nice matte black and we have anodized aluminum. The anodized aluminum, I like to tell people, looks like the finish on a MacBook, iPhone, or something like that, so very sleek, velvety beautiful finish. Along with the rack, you get four drywall anchors, so depending on how you want to mount your board, if you have the studs or not, you can go ahead and use the drywall anchors and four screws, and a set of instructions to help you out. So here it is behind me with the snowboard in it. All you do is you take that down like that. When you’re mounting it, you can kind of mount it wherever we typically recommend mounting it around the bindings, either inside or outside the bindings on each side. These arms are independent, so it’s easy enough to accommodate snowboards of any size, whether it’s a child’s snowboard or a long one for a big heavy guy. You put that up. You measure. You make sure they’re level. You put the two screws in the back. 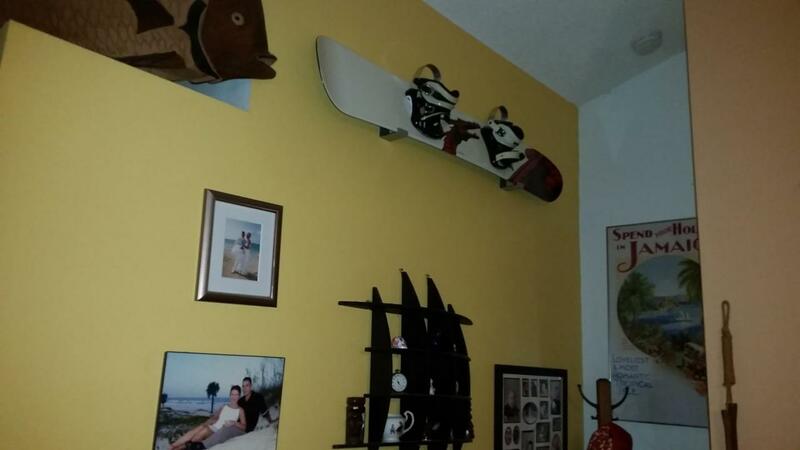 There’s two screw holes in each one, and then after that you put your snowboard out toward the front, tip it back, and it gives that beautiful gallery display type look in your house, so you could just show off your snowboard all year round. That’s it. 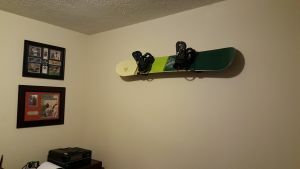 The Naked Snowboard Rack from StoreYourBoard. Thanks! 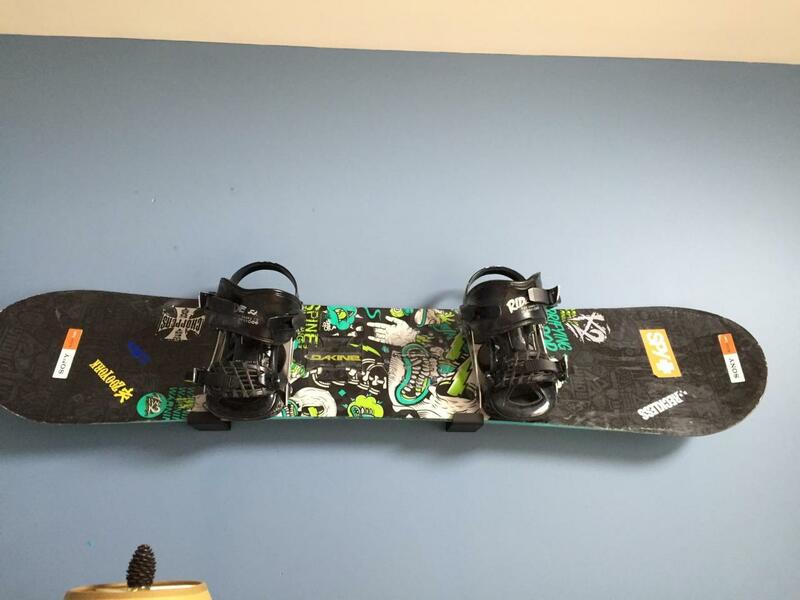 Can the snowboard be hung vertically with the naked rack mount? The naked rack wouldn't work for vertical display of your board. We would recommend either the Hang Time Snowboard Mount or the Floating Snowboard Mount instead. Would I be able to mount this on a concrete wall? Yes, our Naked Snowboard Rack could be mounted to a concrete or brick wall, but you would need to purchase brick/masonry anchors to do so, from anywhere that you buy hardware (Lowe's, Home Depot, etc. ), as it ships with standard mounting hardware only. You can find some additional guidelines about mounting wall racks in our installation guide. Is this the medium or large size? This snowboard rack has one size, it is 3.75" where your board will sit. We do have a larger Wakeboard Rack that has a 6.5" area where a board sits, should one need more room for their board. I have a 152cm Burton feather with bindings and I am curious what size Naked Show I should order? Also, my walls are drywall/plaster so will this hold up my board securely? The place I want to hang it doesn’t have a stud. 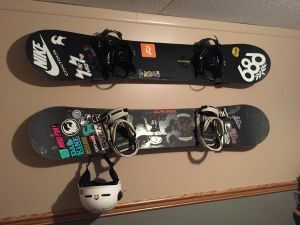 The small sized Naked Snow rack is best for displaying just the snowboard deck (without bindings) or for very small boards with bindings. Your Burton Feather may work on it - but the larger sized Naked Snow might be a better fit since it will give you more room to lean your board back so the bindings won't cause the board to tip over. Regarding the hardware: We include drywall anchors with the Naked Snow Rack, that you should use to mount it to a wall that doesn't have studs -- as long as you use the drywall anchors, you should be fine. The medium Naked Snow rack is best for smaller boards and boards one will store/display without their bindings. This can work for a woman's board like yours, that isn't that long or large, and probably would be fine. If you did go with the larger sized Naked Snow, you would be leaning your board back more on it, because it has more room -- that helps, because if your board does have heavy/large bindings, you avoid the hazard of the board becoming top-heavy and tipping over. I am inclined to think either could work, but the larger size would give you a little more room. Can I sandwich a snowboard rack with a powder ski rack the same way your 16 pair rack share the same pair of feet? Unfortunately our freestanding snowboard stands don't interlock together, and they don't interlock with the ski stands either. You can place them next to each other, but they don't have the feature the 16 ski version has, of using or sharing the same pair of feet. Not sure which size to buy, Large or Medium. I have a 159 Wide K2 Playback Snowboard with bindings attached. 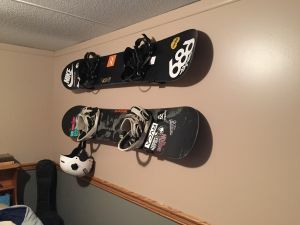 The larger sized Naked Snowboard Rack is normally going to be the way to go if you are storing the board with your bindings on; it will sit better on the large rack. We generally recommend the smaller size for when you just want to store and display just the snowboard deck, without bindings. I'm trying to determine which mount size to get. I have a 157 with Flow bindings that don't exactly fold in very well. I like the idea of the medium size because it doesn't protrude off the wall as much but I'm not sure it'll work for my board. I would definitely recommend the larger sized version of this rack for you since you have the flow bindings on your board making it heavier. With the medium sized version, you risk your board toppling out of the rack and not resting properly in it. I have a 156 board with a binding -- will the medium is big enough for it with the binding? 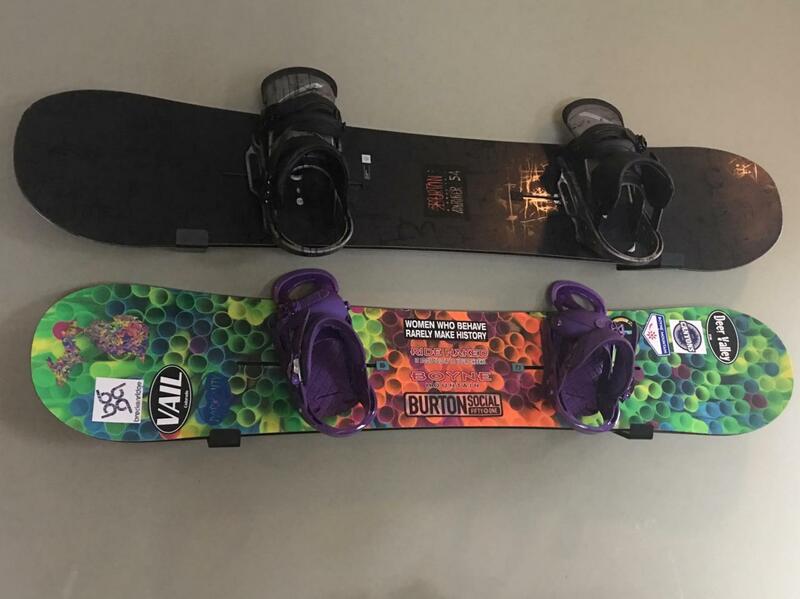 I believe the larger sized Naked Snowboard rack is a better fit for your board with bindings. The smaller size could possibly work, but there is a chance it would be tippy, with the bindings, so my recommendation is the larger size. Simple and easy to install. Been wanting to get this for a while. Looks cool. Your price was $2.00 cheaper than others online. Arrived quick and was easy to mount. Thank you! These board racks are the best things I could invest in. I am going to order another set of them for my other board and hang them above each other. Easy to instal. Easy to put your board on and they look so edgy. Glad I went with the stainless steel finish on them. Amazing. 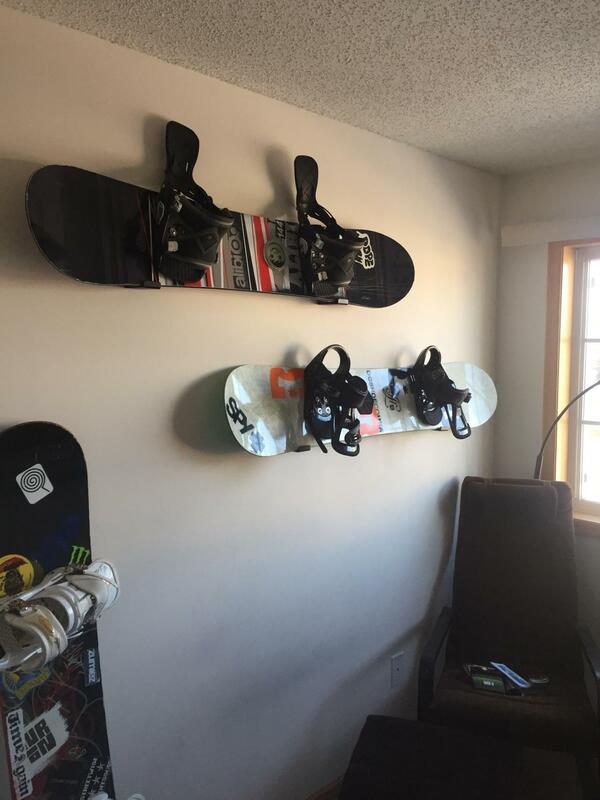 I purchased 3 minimalist snowboard racks and mounted them in my son’s gaming room. The installation was a piece of cake and they look great on the wall. I mounted 2 snowboards and 1 wakeboard and it was great way to display them as well as store them. This product is extremely discrete looks like the board is floating. also extremely durable/strong it can easily support my board with the boots still in the bindings(35-40lbs) 10/10 would recommend to a friend. shipping is really fast as well. Bought this bracket a few weeks back and so far is has worked out just fine. The only complaint I have is that the included dry wall anchors/screws are cheap. When I went to install the bracket, the plastic anchors broke while screwing them in which left me with a decent size hole in the wall that I had to patch. Went out and bought a different brand drywall anchor and the bracket works great. Would recommend screwing the bracket into the studs, if you can. My order of 2 racks arrived quickly. Put them up and they are perfect on the wall. Very sturdy and attractive. Thank you. Easy to install. Easy to mount and dismount board. Would definitely recommend this to someone wishing to display their board horizontally in the off-season without having to remove the bindings. 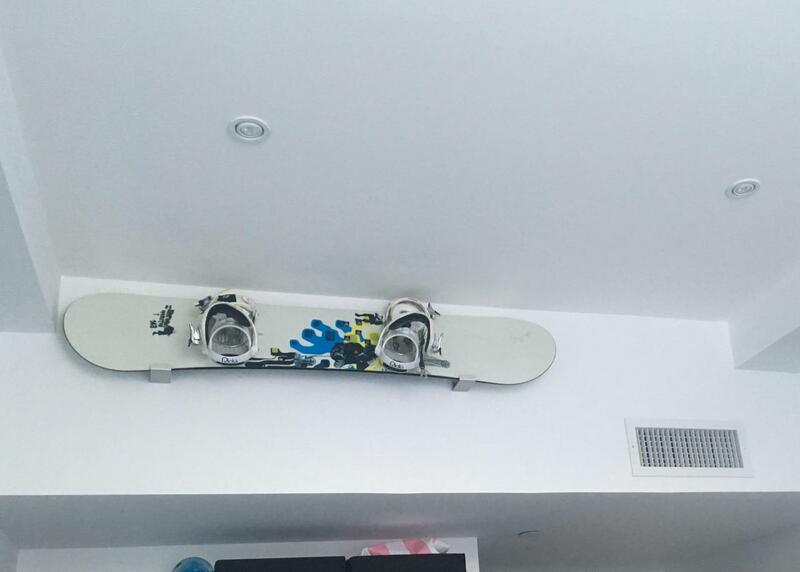 Didn't think in a million years i would be hanging up my snowboard in my place and be decorative. I got tired of seeing my board in the corner in the bag and it annoyed my life lol. When I found the Naked Snow Snowboard Rack I got excited. 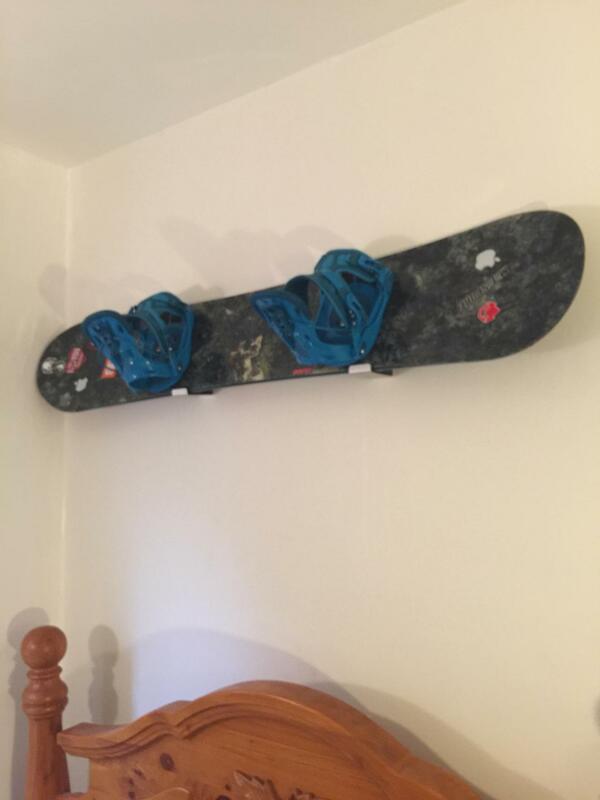 It was Easy to put up and it took my snowboard from being in the corner in the bag to being on display. Win win situation! The small size is perfect but if you want to put your boots in the bindings then you need to bigger size. Awesome stuff! Thank you so much! This rack works perfectly for my daughter's board (142cm). Easy to install and discreet, which is what she wanted. Honest review - this was super easy to install - they even give you drywall anchors (love companies that go above and beyond). Hind site 20-20, I wish I woulda gotten the shorter version - I think the longer mounts work better for low mounted boards you wanna show off, but since I hung mine above the door, a shorter mount wouldn't stick out so much and still would have shown of the board's design. That said, it's a simple solution to an awesome problem (if mounting a snowboard to a wall isn't first world problems, I don't know what is). 5 stars! Super easy to hang. My wife and I both have boards and they look great in the garage. Saves a ton of space. I have the smaller ones and they work perfect. Could not be happier. Written by: George m A. Would buy this rack again quality product. This is exactly what I was looking for to hang my custom Powe. Snowboard. Now I do not have to "put my board away" when the season is over. It was easy to install and I was able to do so in just minutes. Also, the video descriptions and tutorials on the website were quite helpful in helping me teach my decision. I just wish that I had more snowboards to hang. I put this up on my wall and my board has been up there for about a month with no problems. I love that they included the dry wall anchors which are a huge help in support. I recently ran out of room in my room so I put my boots in the bindings and have the whole set hung up. It's been a day and Im kinda scared that it might give out because snowboard boots aren't the lightest of footwear. But I will definitely let you all know if they hold! This is a great buy and would recommend it to anyone. This rack was the perfect solution for my son to store his snowboard in his room. It looks great and is out of the way. 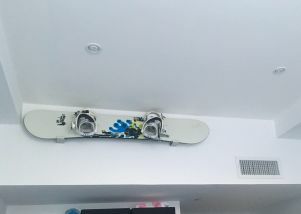 I love the padded L-bracket, it looks great on the wall holding the snowboard. The dry wall anchors that were included were cheap and brittle. The first one I put in broke in half, and there was no stud behind it. I hung the brackets with my own drywall anchors, and it's sturdy. 4 stars for the bad drywall anchor, but 5 stars for the look and functionality of these brackets. I bought two. It turned a boring room into a sick one! This company ALWAYS comes through!! With expediant and wonderufl service!! there is no other place I would go for such products. Worked out perfect for my office. The individual mounts are very clean. The felt is a great addition. I am very satisfied with my purchase and would recommend to anyone looking to display their boards. 1 month of purchase and so far its still into the wall. The brackets hides so well that the boards looks like its floating. Maybe add some led light strips from behind to make it look ethereal. Looks awesome and easy to install. 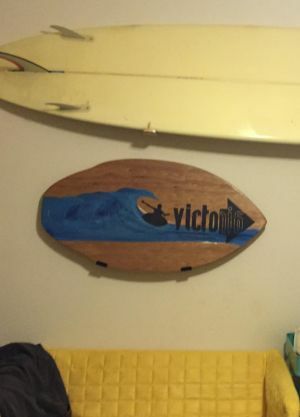 Get it and show off your board! I bought the snowboard mount to hang my thin wood skimboard. Works and looks great, would recommend to anyone for a nice slim wall mount. Awesome little racks fit perfectly on my high wall! Exactly what I was looking for!! I purchased 2 sets of aluminum racks for my sons snow boards. They arrived as advertised and were easy to install. I chose to use different wall anchors but the racks did ship with a set too. My son is very proud of his boards and the depth of the brackets display the boards very well. I'm very happy with the purchase and would highly recommend them. Thank you!! Excellent product! Looks and functions exactly as I expected from the pics and description on the website. I'm very happy with how these racks look and function with one exception. Really, this is more of a recommendation to the manufacturer for a future version of this rack: I have rear entry Flow bindings that have a high profile. This creates a center of gravity that is farther away from the wall. In the next version of this rack, I would recommend that the rack base stick out another centimeter from the wall. This little bit of extra space, allowing boards to sit back at a slightly less steep angle, would make a lot of difference to the stability on the rack of boards with my type of binding. Having said that, my boards are stable enough with the current design. Great Price & Easy Install! Bought one set to hang my first board (which has gone through a lot) almost as a tester since it was a clearance price so why not? And I was very happy with the decision and very pleased with the product. Very fast shipping came in two days and the install almost too easy. Overall great stuff from a great company. I would buy again in a heartbeat. After installing the Rack the snowboard kept falling forward, Since this was installed over my son's bed we added a bent screw at the top to better hold the board. This works good and you just need to give the screw a half turn to remove the board. They are very sturdy mounts and do a fantastic job of showing off my boards. I got the cosmetic defect mounts because I'm cheap haha, but when they came I had to look for the defects and it took a close look to find what was wrong, and now that they're mounted on the wall with snowboards on them, you can't even seem them. Would definitely recommend these to friends, actually, I already have. Great product. Simple to install, great finish and works great. Can't ask for anything else! Affordable, aesthetic, and simple! Great purchase for what I paid and the site had so much to offer! Haven't found a site like this yet! Product came intact and was very user friendly to hang. Quick shipping as well! Great product. The mount is minimalist on the wall and the board looks great! Do yourself a favor and get the drywall anchors if you don't already have them. This rack was exactly as promised. Easy to install and keeps my son's snowboard with bindings off the floor and looking great on his wall. Works great for a cheap rack to store your board but in an earthquake, this thing would not be able to hold your board. you would have to make something like a bent nail in the wall to hold your board from the top so it doesnt fall forward. Only downside I experienced was that it destroyed my drywall (we unexpectedly moved a couple months after installing), but I'm not sure that can be avoided. I searched everywhere for the perfect wall mount and found this one to be the best. It only took like 2-3 days to get this mount for my board which was awesome. Everything came as shown. I did not get the extra dry wall screws and it is hanging just fine, even though for where I wanted to hang my board I was only able to screw into 1 stud. Awesome product would recommend it to anyone. The rack came and was just as I had hoped. Given I didn't have studs in the wall I spring for the drywall anchors which when installed properly are very solid and hold the board with no issue. Great rack and did as advertised. Low profile allows for board to be nearly fully displayed- looks like board is floating. While not flush, it is better b/c no need for top bracket; since I used for my son's board I will be able to store/display any size board as he grows without ever having to drill another hole.